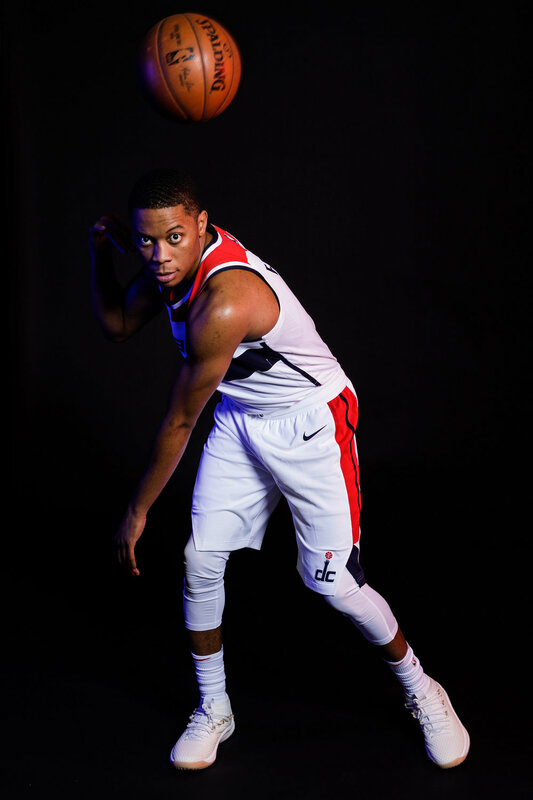 I photographed some pretty cool portraits for NBA Media Day at the beginning of the season. I wanted to shoot something a little moodier than usual and piggy backing on last years media day I knew I wanted to shoot with blue and red gels again. Pretty simple set up. 3 lights. We have the key light as a medium octobox placed high and pointed down and forward. And then on one side a bare strobe with a red gel and the other side had a bare strobe with a blue gel. A 9 foot black seamless from Savage, a medium octobox for the key; high and to camera right, and then 2 stripboxes for rim lighting coming from each side (one with a blue gel and one with a red gel). And here are the images we came out with. Big thanks to the Wizards staff for prompting me on the screaming/cheering photos!